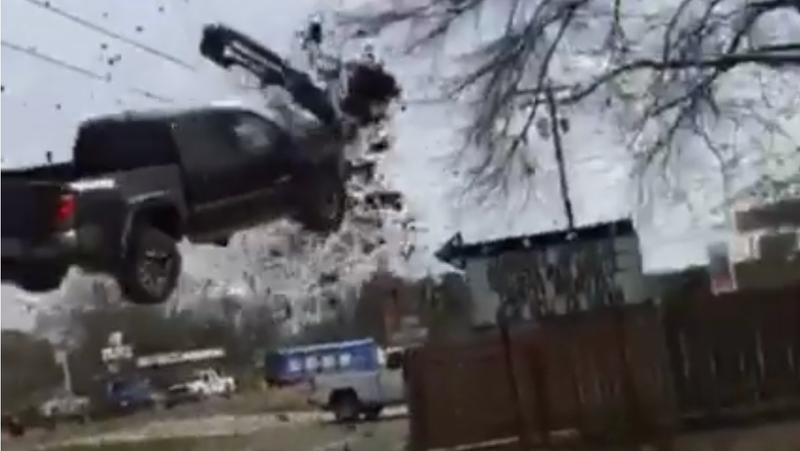 An 18 year-old driving a stolen Toyota Tacoma running from the police in Webster Parish, Louisiana hit a set of spike strips going 115 mph, subsequently barreled off of the road and into a drainage ditch, launched the truck into the air and landed on a car parked at a restaurant. The terrifying crash was captured on video by somebody standing just feet away from the path of the out of control truck, showing the Tacoma fly right into the ditch and then go flying right back out of it. The truck damaged a restaurant and landed on a woman sitting in her car in the parking lot, who somehow managed to escape unharmed, according to KSLA. The 18 year-old driver, Kevonte Dekorey Austin, was a passenger in the stolen truck when it was pulled over for speeding. Austin, an escaped prisoner who is believed to have stolen a vehicle while on work release, slid into the driver seat as the officer spoke with the original driver and took off. Austin and the driver that had originally been pulled over have both been taken into custody and, amazingly, nobody was seriously injured after a freaking two-ton truck fell out of the sky.